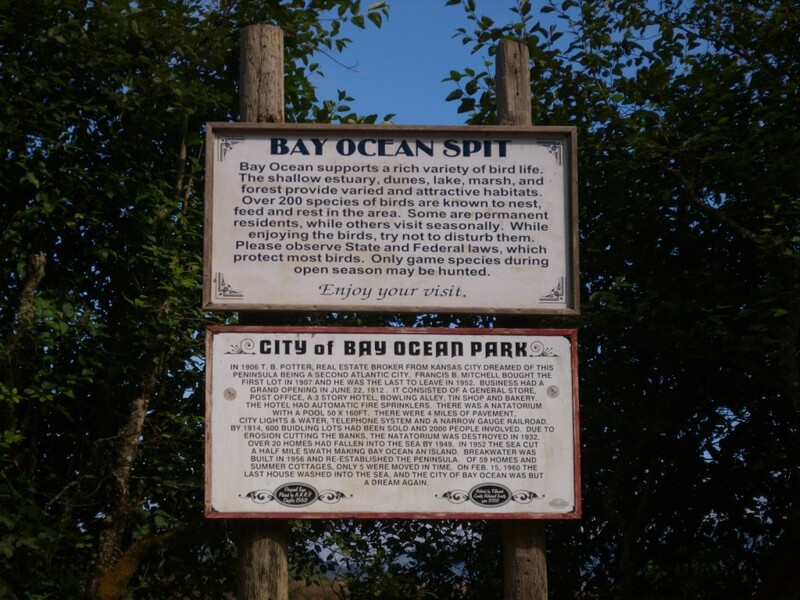 Unlike many of my other Ghost Town posts, there will be no pictures of modern Bay Ocean. That is because the exact location of the town is deep under sand and water in Tillamook Bay. The town was platted in 1906, but the first plot was not sold until 1907. At it’s height of population it had about 2000 permanent residents and an unknown larger number of seasonal tourists. But by 1954, the town was totally empty. In 1956 the US Corp of Army Engineers bulldozed much of the town, but one lonely building survived until 1971. The town was slowly washed away after a jetty was was built to protect the bay. Unfortunately only one of the two required jetties were built, causing the sand to be washed away. Two signs are at the entrance to the spit. These days, the area is good camping, hunting, and most importantly, hiking and bird watching. Bay Ocean Spit can be reached by driving along Bay Ocean Road west of Tillamook and just north of Cape Meares.